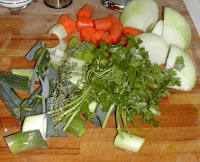 In a large stockpot, combine all the ingredients and bring to a gentle boil. Reduce the heat and simmer, uncovered, for 2 hours, skimming the surface occasionally to remove any foam that forms on the surface. Remove from the heat and strain through a fine mesh strainer into a clean container. (If necessary, strain again.) Remove the meat from the bones and reserve for another use. Discard the bones and vegetables. Let the stock cool completely, and refrigerate overnight. Skim any fat that forms on the surface. Keep refrigerated in airtight containers until ready to use, up to 3 days, or freeze for up to 2 months.